Cardiac arrest – an electrical malfunction in the heart that causes an irregular heartbeat (arrhythmia) and disrupts the flow of blood to the brain, lungs and other organs – is a leading cause of death. Each year, more than 350,000 out-of-hospital cardiac arrests occur in the United States. Almost 90 percent of people who suffer out-of-hospital cardiac arrests die. CPR, especially if performed in the first few minutes of cardiac arrest, can double or triple a person’s chance of survival. 70 percent of out-of-hospital cardiac arrests happen in homes. Unfortunately, only about 46% of people who experience an out-of-hospital cardiac arrest get the immediate help that they need before professional help arrives. More information can be found at www.cpr.heart.org. 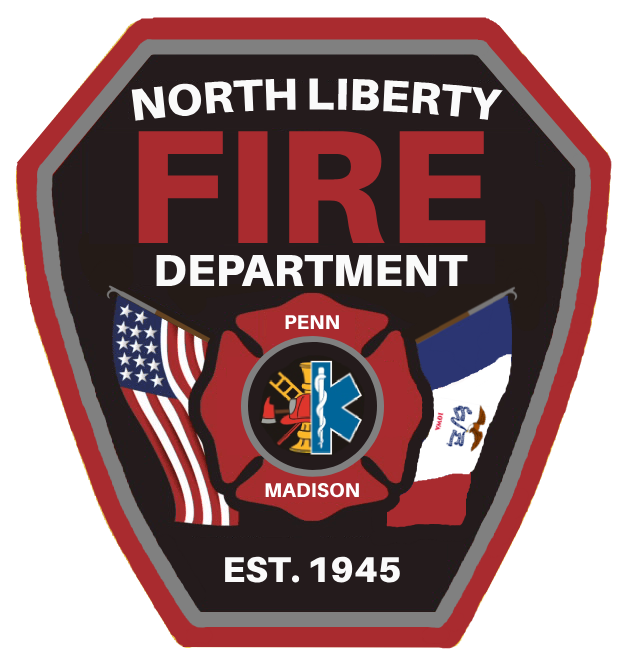 The North Liberty Fire Department provides a variety of American Heart (AHA) first aid, CPR & AED classes. To schedule a class, contact Training Captain Jonathan Lundquist. Heartsaver CPR AED is a classroom; video-based, instructor-led course that teaches adult CPR and AED use, as well as how to relieve choking on an adult. This course teaches skills with AHA’s research-proven Practice-While-Watching (PWW) technique, which allows instructors to observe the students, provide feedback and guide the students’ learning of skills. Heartsaver First Aid is a classroom; video-based, instructor-led course that teaches students critical skills to respond to and manage an emergency in the first few minutes until emergency medical services (EMS) arrives. Students learn skills such as how to treat bleeding, sprains, broken bones, shock and other first aid emergencies. The Heartsaver Pediatric First Aid course is designed to meet the regulatory and credentialed training requirements for child care workers in all 50 states. This course teaches basic first aid, CPR and AED skills for children such as, what to do when a child or infant has a breathing problem, giving compressions and breaths to an infant or child, and stopping bleeding that can be seen. This course trains participants to promptly recognize several life-threatening emergencies, give high-quality chest compressions, deliver appropriate ventilations, and provide early use of an AED. *Textbook/Workbook can be purchased for an additional cost, not included in the cost of registration.